Hi kids, this probably will be filed under the wicked category due to its fat content, but living a healthy lifestyle does not mean you have to ban good recipes – just moderate your diet. Seriously, this recipe tastes like authentic American Chinese restaurant-quality General Tso’s and you must give this one a try. You will thank me. 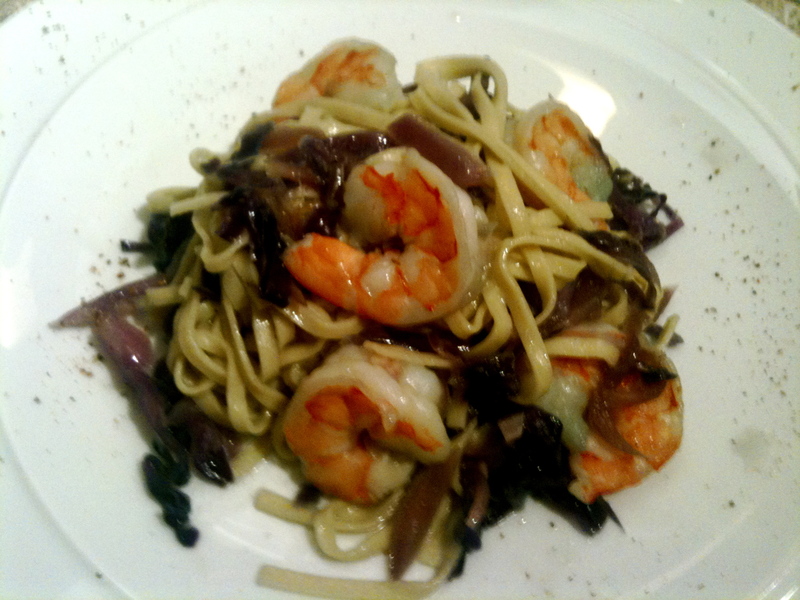 Also known as Linguine with Red Cabbage. GREAT with shrimp tossed in at the end.Cabbage is not evil, just misunderstood. We all know we need our fruits and veggies, however cabbage is often overlooked or plain avoided due to the fact that most people have never enjoyed cabbage cooked properly. Its tough leaves wilt and soften beautifully when cooked over low heat for longer periods. And it’s healthy! In addition to getting a good dose of vitamins K, C and some fiber too, cabbage promotes gastrointestinal and cardiovascular health. Scrape the cabbage over the pasta. Add the reserved pasta cooking water and toss well. Season with salt and pepper. Transfer to bowls, top with the feta and serve. Enjoy! Mix salt with flour, and place in a pile on waxed paper. Make a well in the center, and add three eggs. Lightly stir the eggs into the flour and add the milk, one-half eggshell at a time. Gently work the dough on the waxed paper, pulling up the sides of the paper to help mix it; if it seems really dry, add more milk. If it’s really wet, add more flour. Dough will be a little sticky at first but should come together into a smooth lump. Let dough rest for 5-10 minutes, covered so it doesn’t dry out. Cut dough in half or quarters and roll out on a floured surface. Roll out to desired thickness, and cut into narrow strips. Separate the strips of dough and place on cookie sheets to air dry for an hour or so. Can be prepared several hours in advance. Simmer everything over low heat in large pan until meat falls apart. Remove meat to a plate and allow it to cool. Strain liquid to remove mushy solids, and pick through for any bits of chicken. Return strained broth to the pan. Pick through chicken to remove skin, bones and cartilage, and rough chop the meat. Place the meat in the pan with the broth. Boil lots of salted water in large pan, and add noodles when water is really boiling. Stir and cook for a couple of minutes to “remove the starch” as Grandmommy Nance would say. Meanwhile, heat up the broth and meat mixture until it comes to a boil. Drain noodles from water and put in the broth and meat mixture. Cover partially, and simmer for about 20-30 minutes or until noodles are tender. Season to taste. Definitely going to try this one from Barefoot Contessa. Though it’s been quite sometime since I’ve updated this blog, I certainly haven’t neglected to eat lean and continue to experiment with new recipes, some original, some modified from other cooks’ creations. My goal is to step it up and bring this site back to life as its only purpose was to share recipes with friends and family (this site rarely gets outside hits). With FaceBook, I’ve been able to get other comments and foodie tips and I want to bring those contributions to the site. If you have suggestions, tips for families on a budget, anything, let me know and we can share with all! If you haven’t used tomatillos before, they’re similar to green tomatoes but have an outer husk that you have to shuck prior to preparing. Enjoy this super healthy green salsa!! In a food processor, combine the lime juice, tomatillos, garlic, serranos, onion and cilantro and process to a coarse puree. Season with salt and pepper.